The SD Highway Patrol provided this image from I-90 at Exit 84 Thursday afternoon as a spring storm all but shut down the state. STURGIS, S.D. - An early spring storm continued to batter South Dakota Thursday, closing down nearly the entire state. Most roads in the state were either closed or had no travel advised. 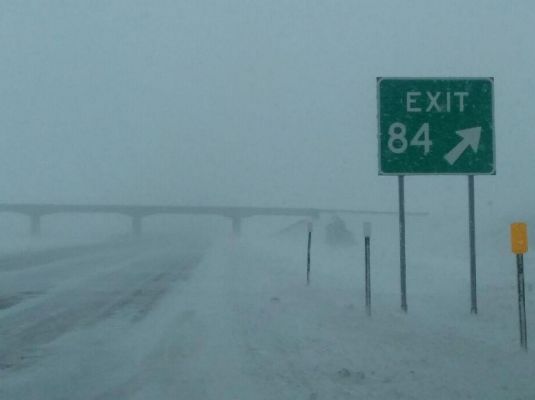 I-90 from Rapid City all the way to Sioux Falls remained closed Thursday night, as was State Highway 34 from Sturgis to the Meade County line. No travel advisories were also up for Rapid City and Sturgis, where law enforcement was urging residents to stay home and let roads crews work. Some sun tried to shine through the clouds late Thursday afternoon in Sturgis, but it was short lived -- and by early evening, another heavy round of snow and blowing snow hit. Roads that were wet became snow covered and slippery once again. One Sturgis resident measured 17.5-inches of snow in south Sturgis, while another report indicated 15 inches. It's a good bet well over a foot has fallen since the storm began Wednesday night. East of the Black Hills, northerly winds all but shut down travel. The highway patrol says visibility was very poor -- near zero at times, and trucks began to fill up the parking lot at the Love's Truck Stop at Box Elder. A semi-truck lost control and blocked part of I-90 near Exit 61 Thursday afternoon. The incident shut down eastbound traffic at Exit 61. Forecasters say Friday should be better, as the low pressure that brought the storm slowly begins to move northeast and out of the area. For most of western South Dakota, a Winter Storm Warning was downgraded to a Winter Weather Advisory Thursday night. It was to remain in effect until midnight. Although the snow was expected to taper off Friday, the winds were expected to remain resulting in some areas of blowing and drifting snow. The Meade 46-1 School District, after missing two days due to the storm, had hoped to get students back Friday. They issued a two-hour late start -- although that could change. Rapid City Public Schools decided to close Friday.